More than 200 alumnae of the Holton-Arms School in Bethesda are said to have signed a letter supporting a classmate who accused Supreme Court nominee Brett Kavanaugh of sexual misconduct when they were both in high school. The signatories rallied around Christine Blasey Ford after she went public in The Washington Post with allegations that Kavanaugh pinned her to a bed at a house party in the early 1980s in Chevy Chase and wouldn't let her leave. Kavanaugh, then a student at Georgetown Preparatory School, denies the allegation. But many of Ford's fellow alumnae have rallied in support. "Dr. Blasey Ford's experience is all too consistent with stories we heard and lived while attending Holton," the letter reads in part. "Many of us are survivors ourselves." Actor Julia Louis-Dreyfus, who graduated from Holton-Arms in 1979, tweeted that she signed on to the letter. The letter, obtained by NBC Washington, demands a thorough and independent investigation before the Senate votes on Kavanaugh's Supreme Court nomination. Republicans have already put off a planned committee vote scheduled for Thursday. Ford and Kavanaugh are now both set to publicly testify before Congress next week, News4 reported. Republican Sen. Shelley Moore Capito of West Virginia, a 1971 graduate of Holton-Arms, was among those who called for public testimony under oath from both Ford and Kavanaugh. Holton-Arms Head of School Susanna A. Jones said the school wasn't involved in organizing the letter but supports Ford speaking out. "It is imperative that all voices are heard. As a school that empowers women to use their voices, we are proud of this alumna for using hers," Jones said in a statement. 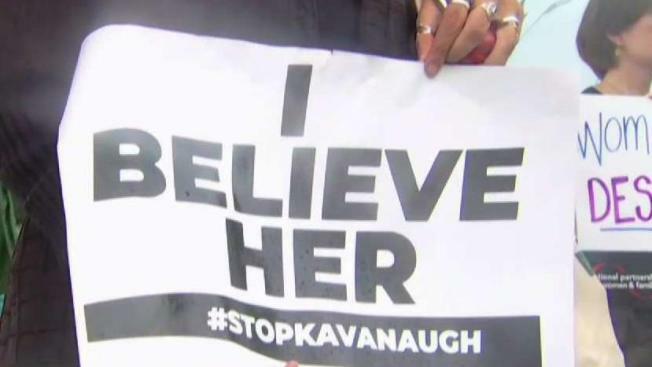 Ford also won support from a group of women who stood outside the Supreme Court on a rainy Monday evening holding signs reading, "I believe her" and "Men who don't listen to women can't lead our nation." But Kavanaugh has his own vocal supporters: Sixty-five women who knew him in high school signed onto a letter released Friday saying he has "always treated women with decency and respect."